(Whitewater Valley)--A suspect has escaped a wild police chase Tuesday morning. Officers began the chase of a pickup truck in southern Randolph County. 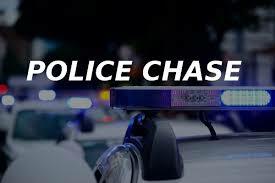 Other agencies joined in the chase as the suspect went through county roads and farm fields in Greens Fork, Williamsburg, and Webster at speeds of a hundred miles per hour. The driver then entered Richmond at high speeds, went briefly to Greenwood Apartments, and then headed east. The chase then crossed the state line. The driver went into a farm field near Paddock Road in Preble County and was able to evade police. Officers were able to get a license plate number. The driver’s name and other details, including what started the chase, have not been released.